Originally known as San Jose de Guadalupe, San Jose was ruled by Mexico until 1848, when, after the Mexican-American War, California joined the United States of America. 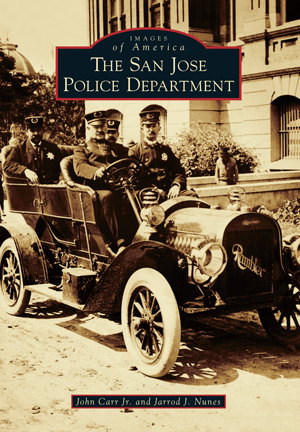 In 1849, the newly elected government appointed a chief of police, and the San Jose Police Department was born. Its mission has been to respond to the distinctive needs of the community from the early agricultural age to today's high technology age. The San Jose Police Department has been a leader in law enforcement technology and training and is considered a model for modern police departments. Today, with a thousand sworn officers and 200 support personnel, the San Jose Police Department serves over a million citizens in the city and polices an area of over 180 square miles. The wonderful photographs compiled over the department's history illustrate the efforts of the hundreds of men and women who built the San Jose Police Department into one of the premier law enforcement agencies in the United States. Authors Sgt. John Carr Jr. and Sgt. Jarrod J. Nunes are veteran members of the San Jose Police Department. Sergeant Nunes is a member of the San Jose Police Historical Society, and Sergeant Carr is the society president.